Dr. Ajay Dhakal received his medical degree and completed his internship at Kathmandu Medical College in Kathmandu, Nepal in 2009. Dr. Dhakal then finished his residency at Maimonides Medical Center in Brooklyn, New York in 2015. 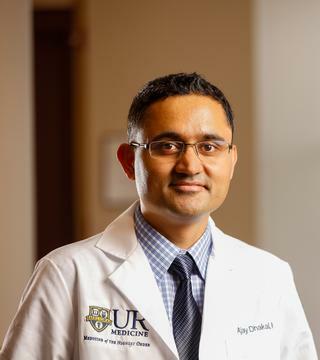 He then completed a clinical fellowship at Roswell Park Comprehensive Cancer Center in Buffalo, New York in 2018. Dr. Dhakal's special interest is breast cancer. His goal is to help breast cancer patients live longer with a good quality of life. Dr. Dhakal is passionate about conducting clinical research to better understand cancer biology and to discover new ways to treat breast cancer. In his free time, Dr. Dhakal likes to travel and watch movies. Dhakal A, Matthews CM, Levine EG, Salerno KE, Zhang F, Takabe K, Early AP, Edge SB, O'Connor T, Khoury T, Young JS, Opyrchal M. "Efficacy of Palbociclib Combinations in Hormone Receptor-Positive Metastatic Breast Cancer Patients After Prior Everolimus Treatment." Clinical breast cancer.. 2018 Dec 0; 18(6):e1401-e1405. Epub 2018 Apr 28. Kharel P, Uprety D, Chandra AB, Hu Y, Belur AA, Dhakal A. "Bortezomib-Induced Pulmonary Toxicity: A Case Report and Review of Literature." Case reports in medicine.. 2018 2018:2913124. Epub 2018 Nov 25. Dhakal A, Chen H, Dexter EU. "A 51-Year-Old Woman With an Increasing Chest Wall Mass Years After Resection of an Early Stage Lung Cancer." Chest.. 2017 Dec 0; 152(6):e151-e154.